MILAN (AP) — Sicily’s Mount Etna volcano unleashed an explosion Thursday, hurling molten rocks and steam that rained down on tourists, journalists and a scientist who scrambled to escape the barrage. Ten people were reported injured. Italy’s volcanology institute said the explosion took place at about 2,700 meters (8,858 feet) above sea level, putting the tourists at more than 500 meters (1,640 feet) below the base of the newest southeast Mount Etna crater where the lava flow originated. Among those present when the explosion occurred was a scientist from Italy’s volcanology institute, Boris Behncke, who said on his Facebook page that he had suffered a bruise to his head. “I am generally fine and having a good, well-deserved beer in this moment,” he added. “Running down a mountain pelted by rocks, dodging burning boulders and boiling steam — not an experience I ever ever want to repeat,” Morelle wrote. The BBC crew was shaken but physically OK despite having suffered cuts, bruises and burns, she wrote. Morelle later showed the camerawoman’s jacket on the air with a big hole in the back where the material had melted in the explosion. Officials at nearby Catania airport announced Thursday they would reduce arrivals by half to five flights an hour due to Mount Etna’s ash clouds. Departures were continuing as scheduled. 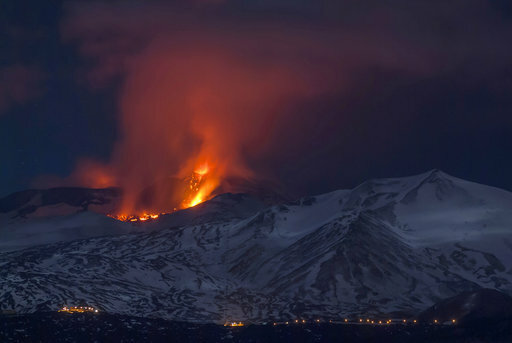 Thousands of tourists each year visit Etna, one of the world’s most active volcanoes located on the eastern coast of Sicily. Eruptions occur frequently, although incidents that involve injured tourists are rare. Authorities limited access to riskier areas on Mount Etna following a deadly eruption in 1979 that killed nine tourists who were standing at the volcano’s rim. Reports indicate that the tourists who experienced the eruption Thursday were in a zone where access is permitted with a guide.